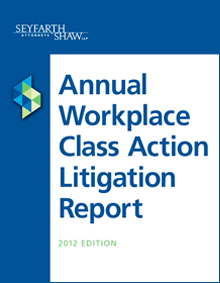 Now in its eighth annual edition, Seyfarth’s Workplace Class Action Litigation Report examines the theoretical and strategic uncertainties stemming from the Supreme Court’s employment law and class action rulings in 2011, and the challenges they pose for companies and their defense counsel. The Report also makes clear that workplace lawsuit filings rose on nearly every front last year, from Fair Labor Standards Act and ERISA to government enforcement actions, with the Equal Employment Opportunity Commission setting a new record for discrimination charges brought against private-sector employers in a single year. Seyfarth notes that the Supreme Court’s decision in Wal-Mart Stores v. Dukes, handed down last June, has already been cited more than 260 times in federal and state court opinions, and AT&T Mobility v. Concepcion has been cited 215 times - remarkable figures for rulings less than a year old. Dukes, which established a new standard for certifying class actions, and Concepcion, which held that federal arbitration law supersedes limitations imposed by individual states, opened the floodgates to a wave a new case law developments in class actions and class arbitrations, which will continue to evolve in the coming year and impact litigants for years to come. The Workplace Class Action Litigation Report remains the sole compendium published in the U.S. dedicated exclusively to labor and employment class action litigation; regarded as "the definitive source on employment class action litigation" (EPLiC Magazine, Spring 2011), it has become the "go-to" research and resource guide for businesses and corporate counsel facing complex litigation. The Report is authored by Seyfarth Shaw partner Gerald L. Maatman, Jr., co-chair of the firm’s class action defense group and co-author of one of two amicus briefs submitted by Seyfarth to the Supreme Court in Dukes. Maatman also led a number of his own winning class action defense strategies in 2011, including a historic turn in a lawsuit brought by the EEOC in which he won the right to depose EEOC officials about the agency’s own personnel practices. This edition of the Report is the most comprehensive yet, examining 976 class action decisions rendered in the past 12 months by federal and state courts, including private plaintiff and government enforcement actions. The number of case rulings covered by Seyfarth climbed 15% over last year’s total of 849 – a direct result of issues raised by Dukes and Concepcion that have loomed over workplace litigation since those landmark decisions last spring. The complete 2012 Report is available to clients of the firm and interested corporate counsel. To request a free copy of the Report, please click the button below. For questions, please e-mail ClassActionReport@seyfarth.com.